TORONTO, ON – November 20, 2018 – The original Toyota RAV4 arrived in Canada 22 years ago, casting the mold for a whole new industry segment, which evolved into the compact crossover SUV. The 2019 RAV4 is, in essence, disrupting the segment it created. It is bringing more sport and more utility back while enhancing the agile handling, everyday comfort and exemplary fuel efficiency that made RAV4 the segment leader it is now. All told, the 2019 RAV4 is designed to tackle urban, suburban or great outdoors Trails with equal aplomb. The look is tougher, and there’s greater capability with a new type of all-wheel drive, yet the ride is smoother and quieter, with new comfort touches inside. 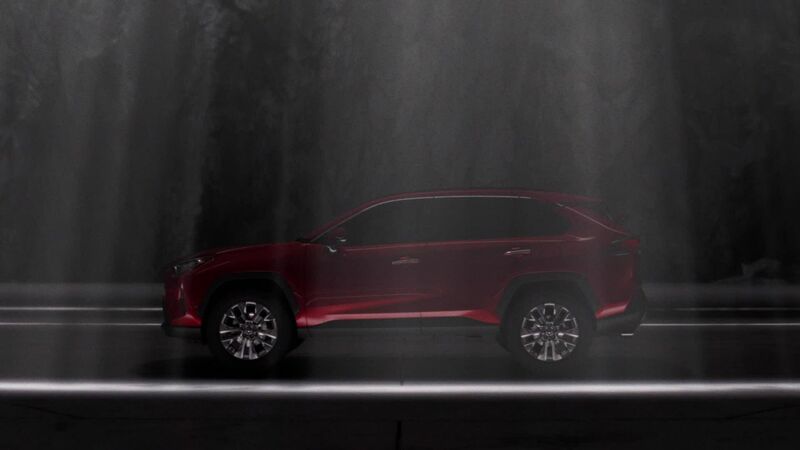 RAV4, the compact crossover SUV trend-setter, is poised to, once again, change the game. The side mirrors are now positioned lower on the doors for increased forward visibility around the A-pillar. Side visibility is increased thanks to a lowered beltline and the redesigned and enlarged rear-quarter glass. Form and function combine in taillights and exterior door handles shaped to contribute to aerodynamic stability. 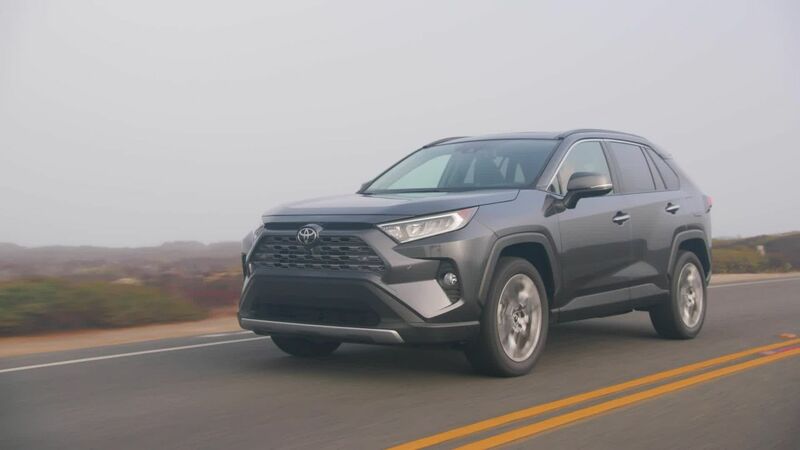 Beneath the 2019 RAV4’s bolder sheet metal, the Toyota New Global Architecture (TNGA-K) platform provides the robust foundation for capability, comfort and safety. The longer wheelbase and wider front and rear tracks provide a stable, confident driving platform. Shorter front and rear overhangs aid the RAV4’s trail driving capability. 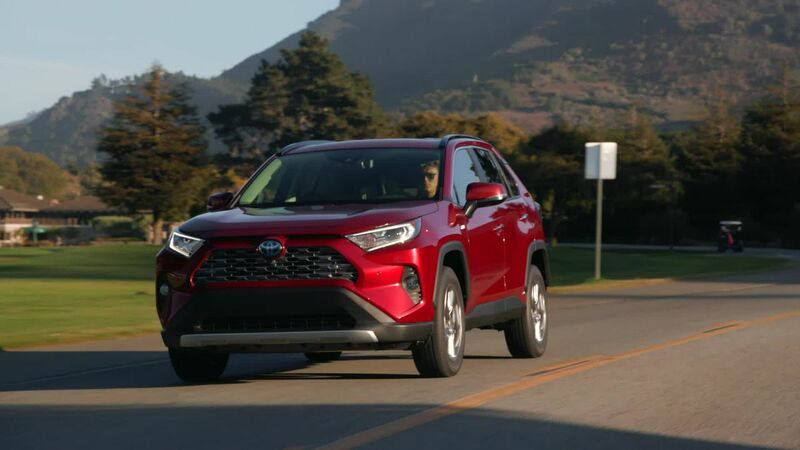 The 2019 RAV4’s unibody structure is 57-percent more rigid than the previous model, allowing tuning for the front strut and rear multi-link suspension that enhances agility while also providing a smoother, quieter ride. The end goal was clear: create a driving experience that is confident and natural. The driver will feel the benefits when steering into the first corner, or over the first bump. RAV4, even with its added capability for 2019, offers crisper on-road handling and an even more compliant and quieter ride than its esteemed predecessor. A lighter powertrain and new steering system are major contributors to that cause. The new parallel-type electric power steering system is rack-mounted rather than column-mounted in the previous model. The new design enhances turning response and delivers a natural feel that can help reduce fatigue on long drives. Higher rigidity in the steering mounting and column further enhances steering responsiveness and feel. The 2019 RAV4 will offer impressive fuel economy, with fuel consumptions of 8.8 / 6.7 / 7.8 L/100 km (city/highway/combined) for front-wheel drive (FWD) models and 9.2 / 7.1 / 8.3 L/100 km (city/highway/combined) for the all-wheel drive (AWD) versions. The RAV4 Hybrid's fuel economy numbers will be announced later. The other eye-opening numbers, of course are for output: 203 horsepower for the gas models and 219 total system horsepower for the HV models. 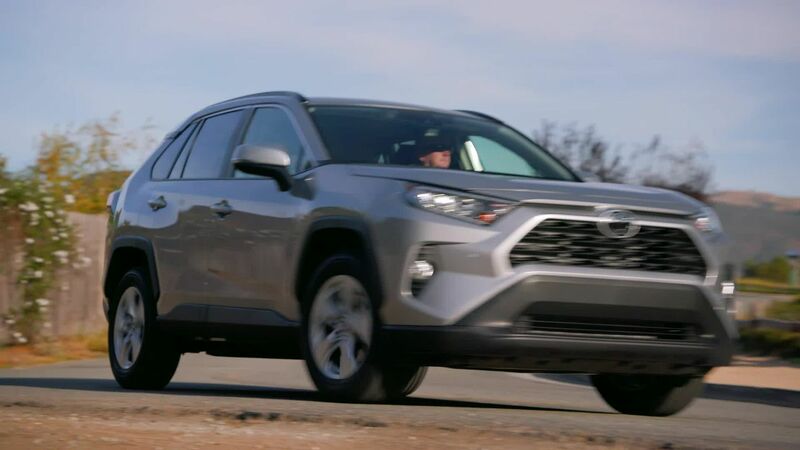 When AWD isn’t required –on long stretches of highway, for example – RAV4 can achieve better fuel economy thanks to the Rear Driveline Disconnect system. The system uses the world’s first ratchet-type dog clutches to stop the rear-axle driveshaft’s rotation, thus significantly reducing energy loss and improving fuel efficiency. Standard on all AWD-equipped gas RAV4 models, Multi-Terrain Select gives drivers the ability to maximize traction when driving through mud, sand, rocks, dirt and snow. The system is easy to use thanks to control buttons or a control dial (depending on the grade) positioned to the left of the transmission shift lever. As with the AWD system in the previous RAV4 HV models, the new AWD version employs a separate rear-mounted electric motor to power the rear wheels when needed. The 2019 system comes standard on all RAV4 HV grades and increases total torque to the rear wheels by 30 percent compared to the previous system. A driver-selectable Trail Mode makes it possible to get unstuck by braking a spinning wheel and sending torque to the wheel with traction. The Refined theme guided interior design, and the word “premium” will come to mind, as well. The dash layout is modern and uncomplicated, yet packed with the latest multimedia technology and some thoughtful surprises. “User-friendly” may sound like a cliché until one experiences it in the 2019 RAV4. The instrument panel’s horizontal layout has a slimmer profile and lower position than before to enhance forward visibility. Its reduced visible angle conveys a feeling of greater openness in the cabin, as well. The thoughtful mix of interior materials conveys a higher level of sophistication in the 2019 RAV4, obvious at first look and touch. Solid material used for the upper and lower parts of the instrument panel and door trim grip conveys strength and durability. Soft padding has been added to areas that passengers frequently touch. These contrasting surfaces emphasize the dual nature of an SUV. Stitching that enhances the continuity from the door trim to the instrument panel adds a sense of quality. In addition, an overhead console offers room for small objects, such as sunglasses. Attention to detail also shows in the way the climate controls can be operated while wearing gloves, greatly enhancing tactility. Rear seat passengers get plenty of attention in the new RAV4, starting with access. The larger rear door-opening angle, reduced distance from the hip point to the rocker, and increased distance from the rear seat to the door trim makes getting in and out easier. Once seated, passengers will immediately feel the benefit of the greater left and right couple distance and legroom, as well as the improved seat cushioning. The rear armrest area is nearly 38 mm wider than before, and its cup holders are deeper. There are new air conditioning vents for the rear seat area, which are standard on LE HV and above on hybrids, and XLE and above on gas models. Previously, RAV4 was already lauded for its quiet ride, but that didn't stop Toyota from making further improvements. The high-strength TNGA platform is the first defense against noise intrusion. Sound-damping and soundproofing materials have been optimized throughout the vehicle, with a particular focus on minimizing noise in the frequencies that interfere with conversation in the cabin. Holes and gaps between parts have also been filled in with sound-damping material for an even greater reduction in road noise intrusion. As one example, the floor silencer pad is now one large piece, and its surface area is increased from 60 percent coverage to 92 percent. Upper level: The heights of the finish plate and deck board surface are aligned, making it easy to store and remove objects. Also, when the rear seats are folded, the rear seatbacks, finish plate, and deck form a nearly flat surface, enabling long items to be carried more easily. Lower level: The height from the deck board to the vehicle ceiling increases by about 55 mm to accommodate taller items. The deck board is reversible: Flipping it over brings a plastic surface, ideal for carrying wet or dirty objects. Every 2019 RAV4 model is equipped with Entune 3.0 multimedia, including Apple CarPlay compatibility. The standard Entune 3.0 audio system uses a 7-inch touchscreen perched atop the centre stack for easy access. Entune 3.0 Audio Plus adds an 8-inch touchscreen and SiriusXM Radio. Entune 3.0 Premium Audio enhances the multimedia system with embedded dynamic navigation. Topping the RAV4’s multimedia offerings is an all-new available JBL audio system. This next-generation premium audio setup incorporates enhanced system architecture, new speaker design and an improved tuning process. The available JBL audio system rocks music of all genres through 11 speakers in nine locations at 800 watts. The result is an all-access pass to the most intimate music concert, all from inside a RAV4. The 2019 Toyota RAV4 gas models will be offered in five grades: LE, XLE, XLE Premium, Trail and Limited. RAV4 HV will be offered in five grades: LE HV, XLE HV, XSE HV, XSE HV with Technology package and Limited HV. The new XLE Premium grade builds on that, adding 19-inch super-chrome-finish alloy wheels; SofTex-trimmed seats with 8-way power driver’s seat and 2-way lumbar; and shift handle with sequential mode. The Trail grade continues in the all-new 2019 RAV4, equipped for all-weather urban, suburban, and trail exploring. Inheriting design features from Toyota off-roaders, the Trail grade represents the pinnacle of the design team’s Robust theme. It is distinguished by standard high-rise roof rails and larger over-fenders, more aggressive bumper, grille design and fog light surrounds. The 19-inch, split five-spoke wheels with matte-black accents are exclusive to the Trail grade and wear 235/55R19 tires. The Trail grade backs up its tough stance with 218 mm of ground clearance and rugged functionality for any road. The Trail and Limited grades are equipped with active grille shutters to enhance fuel economy. 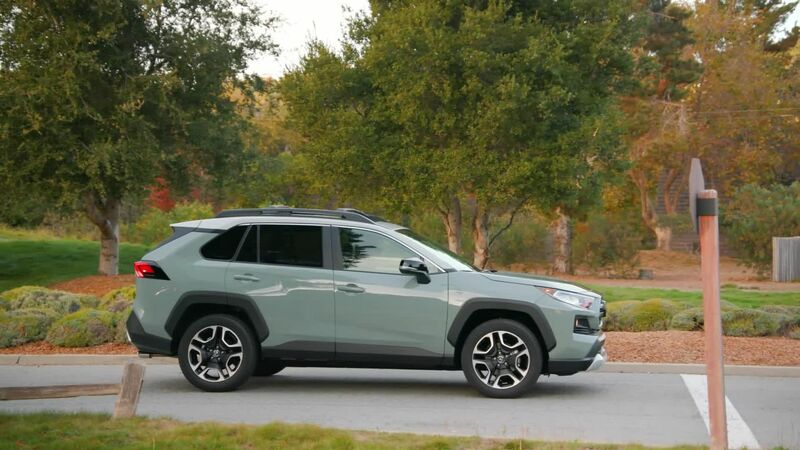 To maximize the adventurous look, this RAV4 Trail grade can be ordered with an Ice Edge-coloured roof that is paired with one of three exterior colours: Midnight Black Metallic and Blue Flame are both new for RAV4, while Lunar Rock is new to the Toyota lineup and makes its first appearance on RAV4. Heated and ventilated front seats are available on the Trail grade, and interior seat finishes come in either black or a grade-exclusive Mocha-coloured SofTex, the latter a brand-new interior finish in the Toyota lineup. Orange stitching accents the interior, with additional orange appointments placed throughout the dashboard. The HV models are the power and acceleration leaders in the RAV4 line with a 7.8-second 0-96 km/h. For those who prefer sportier on-road driving dynamics, the XSE HV leads the charge with its sport-tuned suspension, tauter spring and shock absorber tuning, and 18-inch five-spoke, black-painted sport alloy wheels with P225/60R18 tires, capping off a handling package that makes RAV4 XSE HV hungry for the corners. The look is unique, too, with piano-black accents across the front end, mirror caps, fender arches, and lower rockers. Exclusive to RAV4 HV models, projector-beam LED headlamps and unique signature LED daytime running lamps (on XLE and above) produce a more premium light source. A standard two-tone exterior paint scheme gives RAV4 XSE HV a striking presence. The standard black roof is paired with Blizzard Pearl, Silver Sky Metallic, Magnetic Gray Metallic, or Blueprint (a new colour to the palette). RAV4 XSE HV’s exclusive interior comes mono-spec with black SofTex material and blue accents throughout. RAV4 Limited comes standard with a new 7-inch Multi-Information Display (MID) in the instrument panel, which can, among other functions, display turn-by-turn directions in navigation-equipped vehicles and serve as a digital speedometer. A power liftgate is standard, and a hands-free power liftgate is available. The Entune Premium Audio with Dynamic Navigation system is standard, which includes an 8-inch touchscreen and 11 JBL speakers. The new TNGA-K platform forms the foundation for exemplary collision protection in the 2019 Toyota RAV4, while a suite of standard driver-assist technologies is designed to help prevent collisions, or to mitigate their impacts. Blind Spot Monitor (BSM) with Rear Cross Traffic Alert (RCTA) is standard on all models. Rear Cross Traffic Braking (RCTB) system is standard on Limited grade. Intelligent Clearance Sonar (ICS) is available on Limited and XSE grade with Technology package. 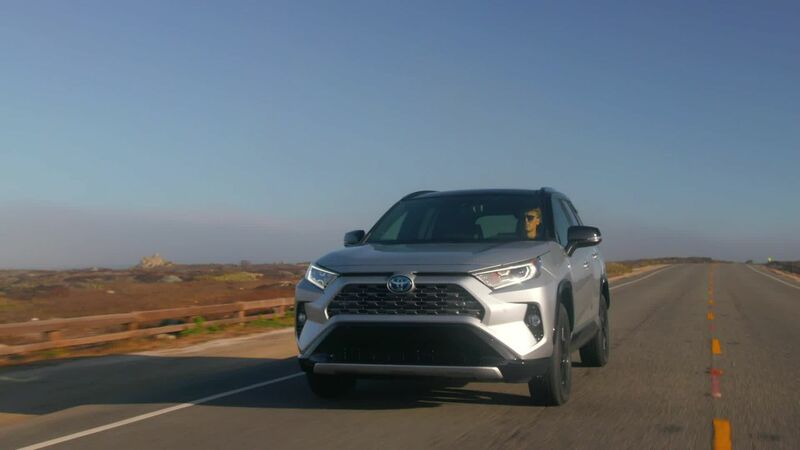 The 2019 RAV4 is equipped with eight airbags, along with a backup camera with projected path, and Toyota’s Star Safety System, which includes Enhanced Vehicle Stability Control (VSC), Traction Control (TRAC), Electronic Brake-force Distribution (EBD), Brake Assist (BA), Anti-lock Braking System (ABS), and Smart Stop Technology (SST). Available safety technologies include a panorama backup camera with customizable dynamic grid lines, and, on the Limited grade, a Bird’s Eye View Camera with perimeter scan, overhead 360-degree view, and curb view. No matter the grade, every RAV4 is a winning choice, whether it’s for a city exploration, a weekend trip to the countryside, or a jaunt on the trails. With seven gas models and five hybrid models, the 2019 RAV4 arrives at dealerships with an option for everyone. The RAV4 Hybrid pricing will be available at the beginning of 2019.